Party politics in India has often been characterized by observers as being patronage-based, chaotic and opportunistic, driven largely by interests of office seeking politicians rather than ideology. This in turn is assumed to have led to corruption, rent-seeking and clientelistic behaviour rather than broad-based programmatic delivery of public goods. Literature also refers to Indian politicians adopting particularistic appeals based on voters’ identity such as caste, religion and region to promise targeted benefits for a segment of voters in return for electoral support. Further, it has been argued that locally influential politicians, including those with criminal charges, who promise to deliver clientelistic benefits, have better chances of electoral success. In this scenario, the elites (politicians) and not the voters are seen to have disproportionate latitude to shape the party system, rendering ideology relatively irrelevant. In a thought-provoking counterview, Chhibber and Verma argue that Indian party politics involves genuine contests of ideas, policies and visions. They challenge the universal applicability of the western notion of ideological space where the rise of nation-states coincided with conflict between labour and capital; centre and periphery; cities and rural areas; and between the church and the state. In particular, these divisions fail to reflect the ideological debates in ethnically diverse societies such as India. Instead, the authors identify two alternative ideological dimensions––‘Politics of Statism’ and ‘Politics of Recognition’––that have shaped party politics in India. While Statism is defined as ‘the extent to which the state should dominate society, regulate social norms, and redistribute property’, Recognition refers to ‘whether and how the state should accommodate the needs of various marginalized groups and protect minority rights from assertive majoritaraian tendencies’ (p. 2). The authors assert that these divisions have their roots in the political debates at the time of India’s Independence about the role of the state in economic and social spheres, and providing special rights to certain marginalized social groups. Using empirical analysis based on National Election Studies (NES) data, voter surveys and Constituent Assembly Debates, the authors show that political parties in India and their voters take distinct positions on Statism and Recognition. They accordingly argue that these themes have constituted ideological space of party politics in India, and can explain the evolution of the Indian party system from Congress party dominance and its decline, to the emergence of regional parties and more recently, the rise of Right Wing Hindu nationalist Bharatiya Janata Party (BJP). They also highlight the importance of transformational leaders in articulating their party’s ideological vision, and in debating competing ideas about Statism and Recognition in India. Overall, the authors imply that ideology rather than office-seeking incentives of politicians plays a primary role in shaping party politics in India. 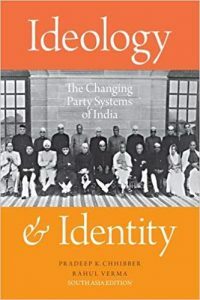 This book represents a bold attempt to challenge a widely held, and a somewhat negative view about Indian party politics being largely opportunistic, and bereft of ideology. The authors’ endeavour to research this complex topic is particularly laudable given that ideology and identity often overlap and crosscut in the Indian context, and the traditional Left-Right divide seen in western democracies does not seem to exist. This makes the task of conceptualizing and studying political ideology in India particularly challenging. While the two themes identified by the authors encompass the key ideological divisions in India, they could have defined and used these more coherently in their analysis. Statism refers to the state’s role in both social norms and the economic sphere within a single theme, but these are arguably distinct ideological domains especially in the Indian context. The question from the 2014 NES to measure Statism focuses (p. 36) on economic policy and not on social norms. So where would one place a party that favours state’s intervention in economy but not in social norms on the Statism scale? Similarly, Recognition aggregates issues related to marginalized caste-based social groups as well as religious minorities. However, the underlying causes for the Recognition issues faced by these two distinct groups can and do vary; so where would one place a party that favours special quotas for specific castes but not religious minorities on the Recognition scale? Further, the two ideological domains could theoretically overlap, for example, the state’s role in social norms (Statism) can also refer to providing quotas to certain social groups (Recognition). Although these points do not take away from the overall scholarship of the book, addressing these would have provided a clearer interpretation of their empirical results. Although the authors undertake detailed empirical analysis to support their arguments, they place too much reliance on NES 2014 survey and the results of 2014 Indian national elections. Further, they do not directly counter the arguments put forward by other scholars who view Indian politics from the prism of clientelism and patronage. For example, what explains low barriers for leaders to enter or exit a party, fluid composition of coalitions, role of money and muscle power in elections, and a significant proportion of legislators with criminal charges? The authors also do not delve sufficiently into the effect of personalistic and dynastic style of politics in most Indian parties, which inhibits debate on alternative ideologies. The authors claim (p. 53) that ‘the rise of India’s post 2014 BJP-led party dominant system is not a coincidence but is instead the culmination of historical battle over ideas.’ However, BJP won on the basis of a relatively low (31%) vote share, Modi-factor, and strong performance in a few large States facilitated by single member plurality electoral system. To this extent, BJP’s success could be considered an electoral rather than popular or ideational victory, and it will take few more elections to assess if it has become a ‘dominant’ party, and whether its rise can be attributed to contestation of ideas. Although the authors stress the role of ideology in shaping party politics, it is not evident from their analysis whether parties actually contest elections based on ideology. If parties routinely abandon their ideological positions to win elections through opportunistic strategies, it is difficult to argue that political contestation is mainly ideology driven. Further, parties in India face constraints to converge to a median voter position because of the multi-dimensional nature of the ideological space, and this contextual complexity could be an alternative theoretical explanation for the parties’ differentiated ideologies rather than a deep belief in them. In practice, party politics in India is neither purely clientelistic nor purely programmatic or ideology-driven. That said, fragmentation of the Indian party system since the 1990s created conditions that were conducive to a more opportunistic style of coalition formation and politics. A peculiar feature of the contemporary party politics in India is that social cleavages based on identity i.e., caste, religion, region and language have become ideologies in their own right, and one does see contestation amongst parties in India on these grounds. However, there seem to be minimal ideological constraints for the Indian parties, and they remain flexible to accommodate candidates based on their ‘winnability’. This also makes it difficult to deconstruct a party’s actions into those based on a stable ideology, and those relating to short-term electoral strategies. As we approach the 2019 national election, it will be interesting to see how ideology and opportunistic strategies will interact to shape the nature of party system in India. The BJP seems to be focusing its campaign on the theme of ‘Nationalism’, which does not fit neatly into the domains of Statism or Recognition themes defined from the perspective of the state. Whether nationalism turns out to be an electoral strategy or a new ideological dimension, relatively independent of the state, remains to be seen, and could be the subject of future research. To conclude, it is not straightforward to differentiate the effect of interests, ideas and institutions on party politics and its evolution in the Indian context, but the authors have effectively argued that ideology remains important in shaping party politics especially as the main catalyst for bringing about a transformational change. Overall, they base their findings on complex analysis and novel arguments, and should be complimented for producing a well-researched and a substantial piece of work stressing the importance of ideology in Indian politics, which should be of interest to a wide audience of scholars and commentators. Rekha Diwakar is a Senior Lecturer in Politics, Department of Politics, University of Sussex, UK.